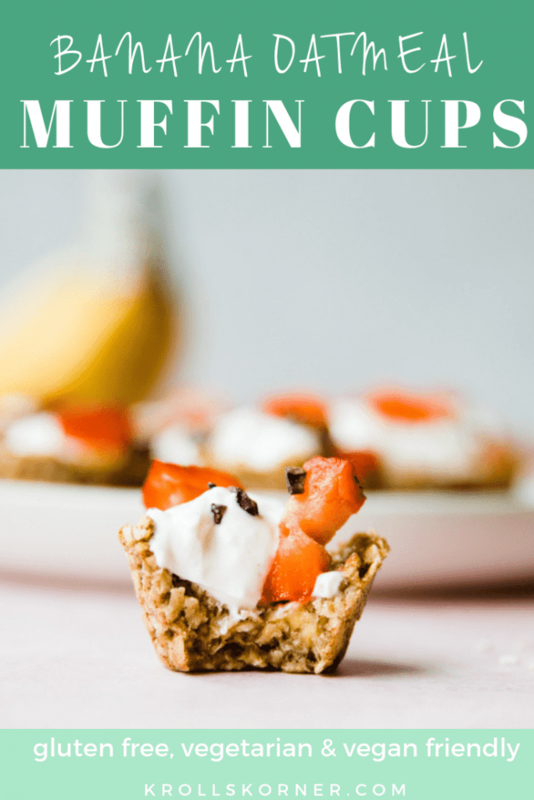 Mini Banana Oatmeal Muffin Cups are a great vehicle for yogurt and fruit! They are easy to make and fun since you can add a variety of toppings! Happy Muffin Monday everyone. How was Super Bowl for everyone?! We had a low-key day at a friends and then enjoyed the night in together. I’m not too big into sports so I just enjoy the time hanging out with friends! Can be made into healthy desserts – serve with a little ice cream in the oatmeal cup and top with sprinkles! These can be a great little treat to have post meal time (breakfast, lunch or dinner, it doesn’t matter!) I love how customizable the toppings are. You can add raspberries, strawberries or blueberries, bananas, peaches…really any fruit that you like with yogurt! 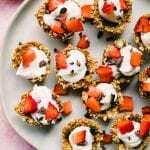 My favorite yogurt with these mini banana oatmeal cups is vanilla, but you can use whatever flavor yogurt you like! Pro tip: Add in peanut butter into your yogurt and then into the muffin cup. Top with chocolate chips…such a yummy and healthy treat! Where can I buy a mini muffin tin to make these? The only lengthy part to this recipe includes placing the muffin cups in the fridge to set up for 30 minutes. Then you will bake at 350 degrees F for 15 minutes. Let them cool and then they are ready for you to scoop your yogurt into each cup and top with your favorite fruit or toppings! If you like these muffins, I am sure you will enjoy these quinoa eggs muffins and these breakfast muffins made with an egg in the middle! 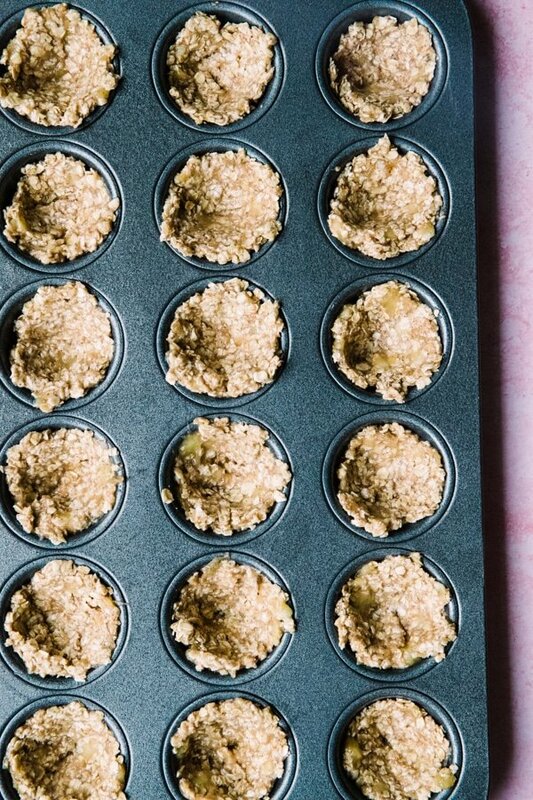 As always, I hope you love these Mini Banana Oatmeal Muffin Cups! 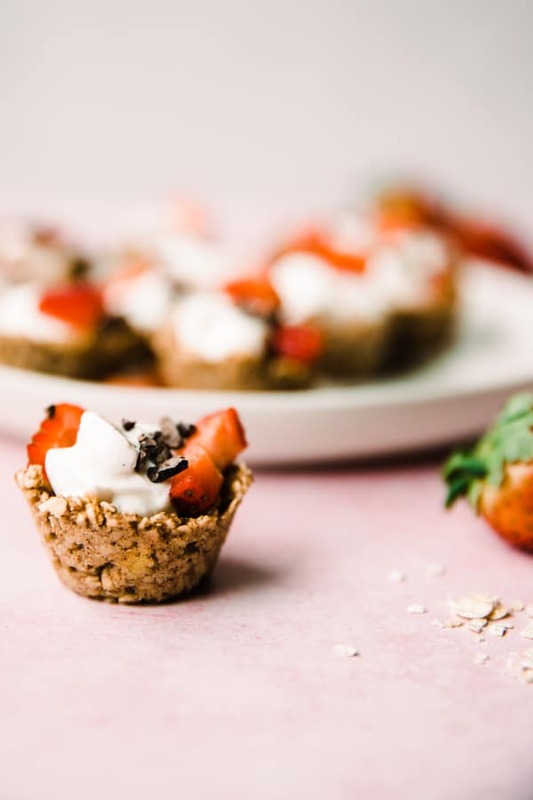 Fill these banana oatmeal muffin cups with yogurt and fresh fruit for a healthy snack, or top each muffin bite with a dollop of ice cream for a post dinner treat! Strawberries, blueberries, yogurt, ice cream, bananas, chocolate chips, cacao nibs. In a medium sized bowl, mash the bananas. Then add in the remaining ingredients and mix well. Spray a mini muffin tin with PAM and then press about 1 Tbsp. into each muffin cup. Use the back of a spoon to press the oat mixture down and slightly up around the edges creating a mini cup! Place in the fridge for 30 minutes, and then bake in the oven at 350 degrees F for 15 minutes. Let cool slightly and then add in your yogurt and favorite toppings! PIN THESE MINI BANANA OATMEAL MUFFIN CUPS FOR LATER! 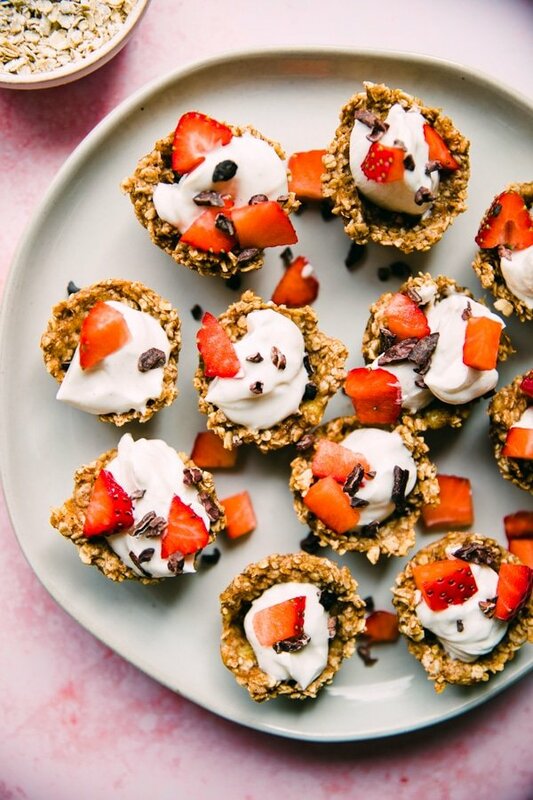 Can’t wait to make these and top with Greek yogurt and diced strawberries!!! yay! I hope you love them! Thank you! Did I miss the baking temperature in the recipe? What a delicious breakfast treat! Love how easy these are to make! This is my kind of breakfast. Also, these would be great as after school snacks for the grandkids too. Delicious and nutritious. Sounds like a baking plan for the weekend. Great idea! I hope everyone loves them. Thank you! Definitely one of my favs for Muffin Monday additions! I try to bake on Sundays for the week. Fantastic recipe! Yum! I’m always looking for easy, make-ahead breakfast recipes. These look delicious and healthy! Thank you so much Danielle! A fun and healthy treat for sure! Delicious. I’ll have to make this and eat it for breakfast. Thank you so much Luci, I hope you enjoy them!